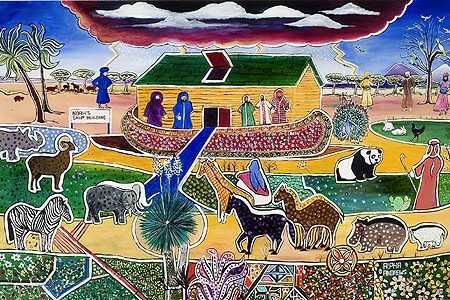 "Big Storm A-Comin' (Noah's Ark)", by Alpha Andrews, is featured in "Amen, Amen." Dialogues on sin and redemption, the intersection of politics and religion, and the experiences of religion in the everyday life in the American South are depicted in Amen, Amen: Religion & Southern Self-Taught Artists, currently featured at Gonzaga University's Jundt Art Museum. Upon entering the gallery, guests are confronted with contrasting displays on both sides: devils on the left and angels on the right, establishing the battle that takes place throughout the exhibit. R.A. Miller, an illiterate folk artist, uses plywood, old window shutters and meat packing trays as materials for these representations of good and evil. In fact, much of the art in the exhibit is made up of simple, found objects, from tin and cardboard to framed posters that have been painted over. The exhibit's featured artists were mostly uneducated, and some created their pieces in prison, or for rustic art booths at gas stations. Those on the fringes of humanity often have a unique ability to comment on the human experience and thus spur controversy and debate amongst the broader public. The 117 pieces on display in Amen, Amen are borrowed from a larger private Carl and Marian Mullis art collection in Atlanta. Since the pieces have been twice removed from their context, once from the settings in which they were created and the again from the American South to the Inland Northwest, extended biographies are provided for each piece, familiarizing us with their backgrounds. Gonzaga has chosen to focus on the exhibit's theme of religion and spirituality because of the university's Jesuit affiliations, but other specific subtopics within the collection include creationism, narratives from the Old and New Testaments, examples of faith in daily Southern life, politics and religion, the crucifixion, and of course, expectations of the apocalypse. River baptisms, country churches and haunted houses are among some of the everyday scenes of the American South depicted in the exhibit. Commentaries range from 9/11, the presidential election of 1992, the Contract with America, and capitalism. New Jerusalem is imagined as high rise apartments in a post-apocalyptic depiction. Each artist in Amen, Amen is distinct in their art styles through repetition. Such trademark images are what make folk artists so identifiable. 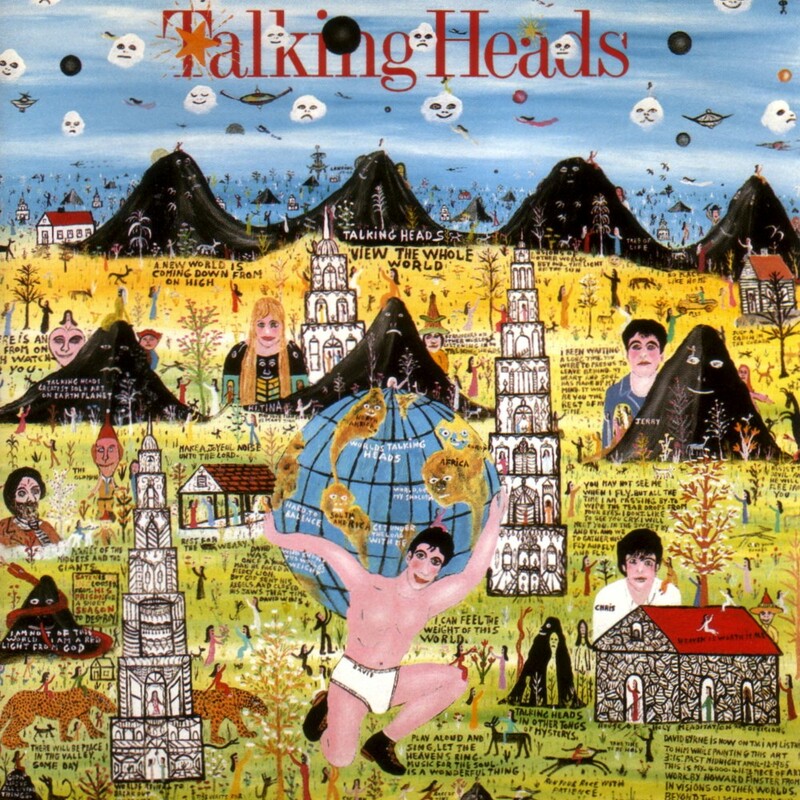 It's why Howard Finster, featured in the exhibit and who became somewhat of a folk art celebrity in the 1980s, caught the attention of bands like REM and Talking Heads and was asked to create their album art (right). It's why Minnie Adkins was requested to create a nativity scene specifically for this exhibit, making her piece the most contemporary one in the show. Even though the aesthetics may be simple, the symbols and meanings have the potential to be incredibly complex. Amen, Amen runs through Jan. 10, 2015 at the Jundt Art Museum, at 200 E. Desmet, on the Gonzaga campus. Gallery hours are Mon-Sat, from 10 am-4 pm. Attend a public walk-through of the exhibit with Jundt director and curator Paul Manoguerra on Fri, Oct. 10, at 10:30 am. WHAT'S UP TODAY? Two local film premieres and contra dancin'!